The A.V. Club premieres a new track of off eccentric actor Vincent D'Onofrio's "punk" spoken word record, causing one writer to recall an awkward family event. I have a weird relationship with Vincent D'Onofrio. Not that we have ever met, mind you, but he made quite an impression on me when I first watched him play Private Leonard Lawrence in Full Metal Jacket with my dad and sister. I was still in high school when I originally witnessed the poor, bumbling Lawrence suffer a mental breakdown from the verbal beatdowns doled out by R. Lee Ermey's Senior Drill Instructor, Gunnery Sergeant Hartman and [Spoiler alert just in case you haven't seen a film that came out in 1987] eventually gun down Hartman and commit suicide. It was a pretty shocking and powerful moment, and my dad used the stunned silence that followed to announce "You know, your grandfather was a drill sergeant." Needless to say, his spectacular timing made it was a little weird to be around my grandfather for a short while after that. Because of that slightly scarring event, I've always taken note of anything D'Onofrio has done since that... interesting night. His post-Full Metal Jacket career hasn't had anything that's impacted me quite as much, bugging out as Det. Robert Goren for 10 years on Law & Order: Criminal Intent and as, well, an alien bug in Men in Black. The eccentric actor has moved on to a new project as of late, with The A.V. Club premiering the first track from his upcoming spoken word album Slim Bone Head Volt, a collaboration with multi-instrumentalist Dana Lyn. 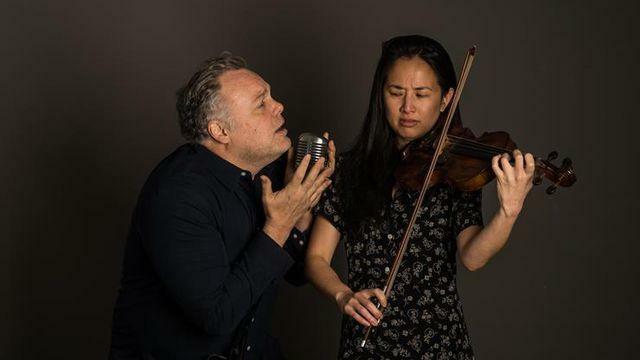 First track "I'm a Hamster" makes for an interesting 94 seconds of audio, with D'Onofrio ranting about being a small rodent who is not pleased at all about his current living arrangements while Lyn supplies a medley of angry strings, brass a percussion. It's certainly worth a listen, at least for the novelty of it all, so head to The A.V. Club to check it out.. Also, it hasn't brought up any slightly traumatic memories of any of my relatives, so that's a win.